Li De-Wei, Chen Jingyuan & Wang Yixun (2010) Two new species of dematiaceous hyphomycetes from Hubei, China. A field trip was made to Houhe National Nature Reserve in Wufeng County, Hubei, China in August 2008. Among the fungal specimens collected were two undescribed species of dematiaceous hyphomycetes, Scolecobasidium houhense sp. nov. with conidia fusiform, minutely verruculose, brown, 3-septate, 26–31 × 4.5–5.5 µm and Spadicoides wufengensis sp. nov. with two kinds of conidia: 1-celled conidia, ventricose or ovoid, brown, smooth, 5.5–9 × 3–4.5 µm, and 3-celled conidia of synanamorph, obovoid, smooth, brown, truncate at base, 8.5–12 × 3.5–5 µm. 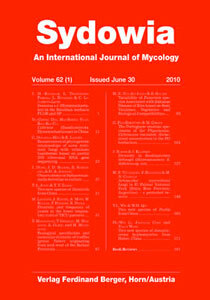 The new fungal taxa are described and illustrated.